Convert your leftover obsolete Czechoslovak korun banknotes to cash using our hassle-free online exchange service. Get paid fast for your unused currency from the Czech Republic. The Czechoslovak Koruna was the currency of Czechoslovakia before the country split up into the Czech Republic and Slovakia, in 1993. Czechoslovak koruna banknotes are now obsolete. We continue to exchange Czechoslovakian banknotes at a rate that covers their collectable value. We also exchange Czech koruna banknotes, Czech koruna coins, Slovak koruna banknotes and Slovak koruna coins. 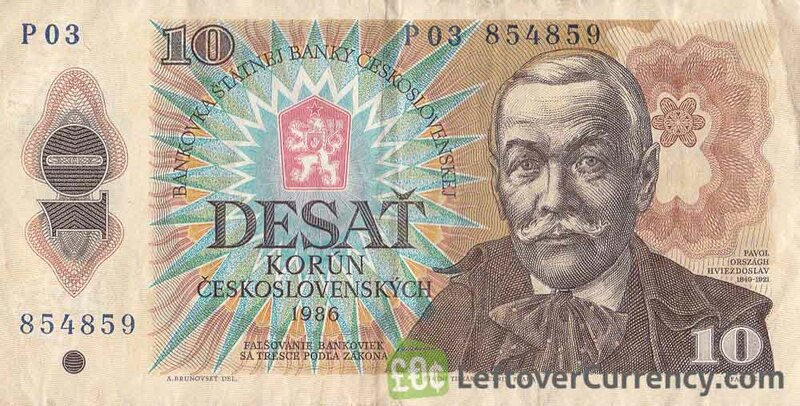 Do you have obsolete Czechoslovak korun banknotes like the ones in the pictures below? Add the amount you want to exchange to your Wallet. You'll see exactly how much money you'll get for your Czech Koruna. Click on the Wallet symbol to complete checkout and get paid within 5 days of receiving your currencies. The brown colored 500 Pätsto Korún note features soldiers and a medieval shield, along with the Devin Castle mountain fortress ruins near Bratislava. This banknote of 25 Czechoslovak korun has the image of Jan Zizka on the front side, next to arms and banners. The back side shows Tabor town square.